Your perfect office eye stylist is here! The versatile colors in the Lakme 9 To 5Eye Quartet and the high-intensity powders give your eyes a defined finish. The radiant color and shimmer particles shape and highlight your eyes to give you that professional edge. Use the lighter shades for office wear and darker shades for your night look. The special applicator makes it very easy to do your own eyes and you can mix the shades to create new looks everyday! Buy the Lakme 9 To 5Eye Quartet, right away! 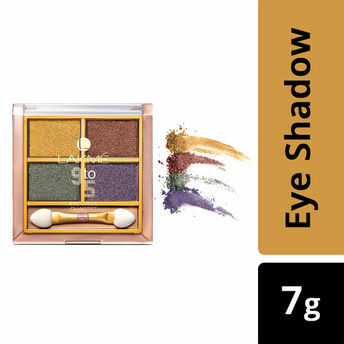 Lakme 9 To 5Eye Quartet has a versatile palette of eye shadows developed specially for work. Lakme 9 To 5Eye Quartet is packed with key features like: High-intensity powders with delicate hints of shimmer, Smooth and silken texture, 4 eye shadows in 1 palette, Comes with a sponge applicator, Available in 4 palettes. Pro-Tip: Once the tip gets a little blunt it's great for experimenting with bold, smokey looks. For finer strokes sharpen with Lakme Dual Sharpener. Lakme 9 To 5 Eye Quartet goes well with 9to 5 weightless mousse foundation as base, 9to5 matte lipsticks, and Eyeconic kajal for an enhanced look. Radiant color and shimmer particles. Quartet with 4 ready to blend colors. Useful for all looks: party/ wedding/ everyday look. Explore the entire range of Eye Shadow available on Nykaa. Shop more Lakme products here.You can browse through the complete world of Lakme Eye Shadow .Alternatively, you can also find many more products from the Lakme 9 To 5 Eye Quartet Eyeshadow range.